Location is still an acquired taste for a lot of consumers, many of whom have yet to check in anywhere. But the power of location and its ability to bridge the online and the offline worlds is increasingly being realized by savvy start-ups like SCVNGR, which has found success building a game layer over the world. SCVNGR is a location service that tries to deepen experiences at locations by creating simple game-like challenges for its members when they check in. The Boston-area start-up shared some data with me from an ongoing campaign with Buffalo Wild Wings, a national sports-bar chain that is seeing a boost in extended engagement from its use of SCVNGR. Since the Home Court Advantage campaign began on Jan. 3 for the college basketball season run-up to March Madness, the chain has seen 77,538 players participate in SCVNGR’s challenges at its restaurants, one in three of whom returned again. Players have completed an average of six challenges and have created almost 7,000 challenges collectively. With SCVNGR, big businesses can pay to run their own challenges and reward members for completing certain activities. Or users can make their own games and add them to the list of challenges at a location. At Buffalo Wild Wings, users earn a couple of points for downloading the iPhone (s aapl) or Android (s goog) app, for example, then earn more points for things like taking a picture of rival fans. Players can earn free sodas and discounts after hitting certain point triggers. Jeremy Burke, brand manager at Buffalo Wild Wings, said the campaign has exceeded the chain’s goals by keeping customers more engaged and loyal to the restaurants while expanding the company’s online presence. He said the campaign has created 38 million social impressions, with 45 percent of players sharing their completed challenges on Facebook or Twitter. He said the company’s Facebook page has also reached 4 million fans, aided in part by the campaign, and restaurants are consistently seeing 2,000 new players a day. Burke said the appeal of SCNVGR was in enabling the chain to build custom campaigns around different sports seasons. Players, for instance, can compare their scores on a Home Court Advantage campaign microsite. Burke said players are not only more engaged with the Buffulo Wild Wings brand; they tip their servers better too. For SCVNGR, it’s proof that location can be powerful and lucrative. In talking to CEO Seth Pribatsch recently, he said the key to location is treating each place differently. For businesses who create unique location experiences for customers, they have a better shot at engaging them rather than having them just do a generic check-in. 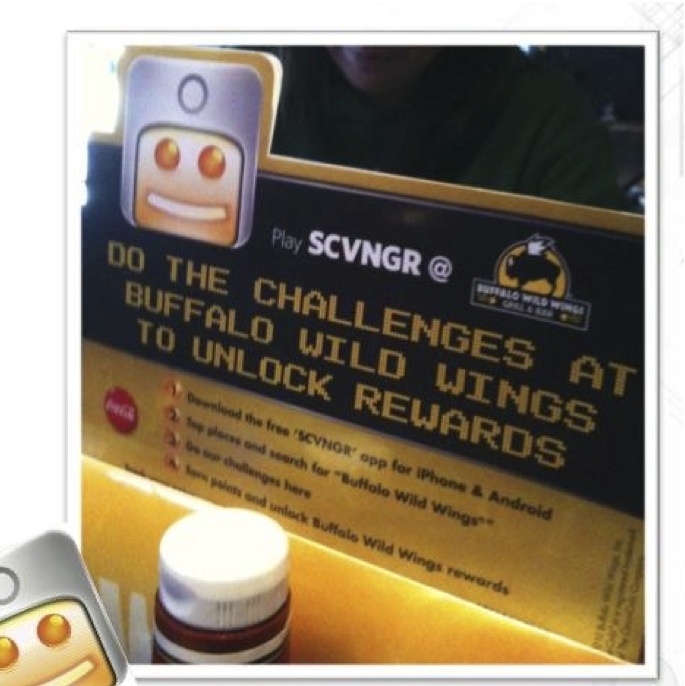 The business deal with Buffalo Wild Wings, SCVNGR’s largest partnership with a full-service chain, also highlights the moneymaking opportunities for the location service. The campaigns command a premium and are extremely sticky; Priebatsch said more than 80 percent of its 1,000 corporate customers are repeat clients. That’s likely how Priebatsch can claim that SCVNGR is out-earning Foursquare “10-to-one or 20-to-one each month,” as he did in an interview with Inc. last month. These are still early days in location, but the lessons SCVNGR is learning are helpful across the industry. Location-based services can be very beneficial in building engagement, bringing in customers and driving repeat visitors, but the services need to provide memorable experiences. Users are more likely to tweet about a game they played at a restaurant than just visiting the establishment, and they’re more likely to create content when it’s built around fun. Now, there’s a potential for this to be a bit of a novelty for users, who haven’t experienced real-world games like SCVNGR’s. But if the challenges are kept fresh, and the experience evolves over time, there’s no reason why this can’t be a major component to the growing location game. I’m a huge fan of SCVNGR but let’s be clear. The reason why BWW had tremendous success had less to to with SCVNGR and more to do with a comprehensive Social Media strategy, a commitment to creating and curating unique content and the work they had done building their brand prior to launching this campaign.